Do you want to create some romantic spirit? Then head to the Old Baska, compose graffiti from rocks and prepare a romantic meal in one of the hidden coves. Stara Baška is a small, old touristic town situated on the southwestern part of the island, which belongs to the municipality of Punat. In the Old Baška there are extremely narrow streets, which leads almost trough the peoples yards, but this interesting narrowly constructed town surely has its charm. Name Stara Baska began to be used in the second half of the seventeenth century. Previously, this shepherd’s village was called Kraj or Podkraj, which means Place. Stara Baska is known for its exceptionally clear blue sea and many mighty cliffs that surrounds the whole area. Besides the sheep culture, in old Baška, thanks to a wide range of plants and herbs in the karst terrain, they have also developed beekeeping craft, which helps the locals to produce a quality honey. Stara Baška offers accommodation with apartments, and auto camp Škrila. Stara Baska is different from other parts of the island due to its rather isolated location. In the old days it was accessed only by sea or along the narrow paths over the hill. That was a good place for the refugees who were in Stara Baska hiding from the Turks. Today we can notice that people in this area have different way of speaking and customs, than the rest of the island. In 1980, they paved a road, which today connects the Old Baška with the rest of the island. 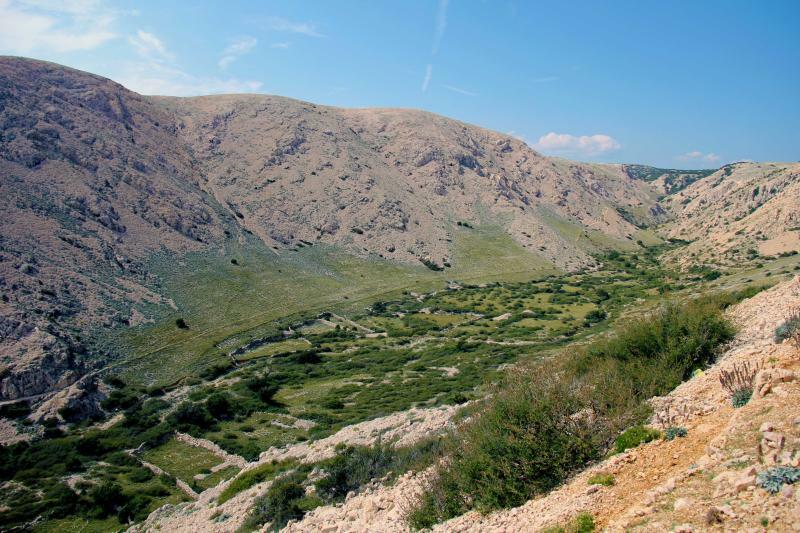 Follow this road all the way from Punat and you will arrive to the area in front of the camp Škrila, where you will notice a series of cars parked on the left side of the road. These are the cars of people visiting the nearby beach, which is located below the steep road. Tomaž and me visited this beach as well. We parked the car on the road and put the stones under the tires – so it would not escape. Then we looked at the bay and some kind of pasture surrounded by a stone wall. We of course noticed the graffiti, made of rocks on the grassy ground. Obviously someone wanted to show her how much they love someone, and created a big sign from rocks I LOVE … which can be seen from the top of the road. Someone had to be first, because today it has obviously became a tradition. The whole area is filled with various stone inscriptions like: I love you, names, peace signs and things like that. After we took photos of the bay and graffiti we went over the fence into a steep valley all the way to the blue bay. On the way you have to be careful, because it can quickly happen, that you slip on this red earth and rocks. This bay is strongly visited by tourists so it is quite crowded, on the beach there is also a small hut with tables where you can order a drink or rent a pedal boat. After swimming and enjoying the beach and its clear blue sea, the sun slowly began to descend and a shadow started to rise above the bay. We decided to take a walk at the far edge of the bay, where we spotted a cozy small hidden bay at its very end, which can be you private small beach resort, if you arrive there first, of course. When we went back towards the beach we felt a bit of hunger in our stomachs. When we photographed towards the beach, we saw some fig trees in the background. A big smile was painted on our face, so we quickly moved closer to the tree. From a distance it looked a lot more accessible, but it was not so easy. 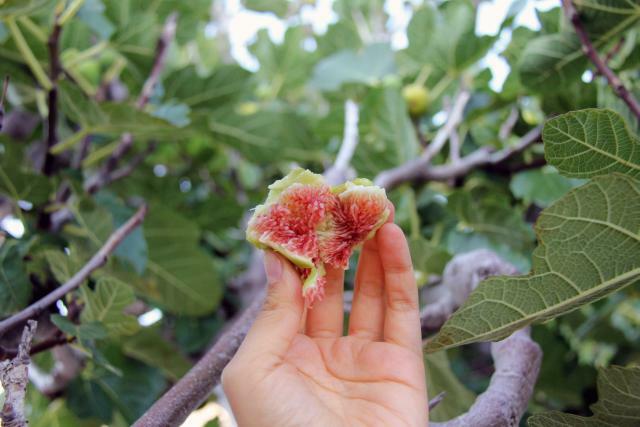 Yet, figs were therefore, because of our effort, much sweeter. Along the way, however, we also met a big mantis, which unlike us, probably just ate her partner instead of sweet figs. When you look at the coast of Stara Baska, you will noticed that it is mostly covered by cliffs, and with them comes, many great, secret, small and large bays for swimming. A great place if you want to surprise your loved ones with a romantic lunch or dinner in a secret cove, and before that put graphite in the rocks, where they can read: Would you marry me?